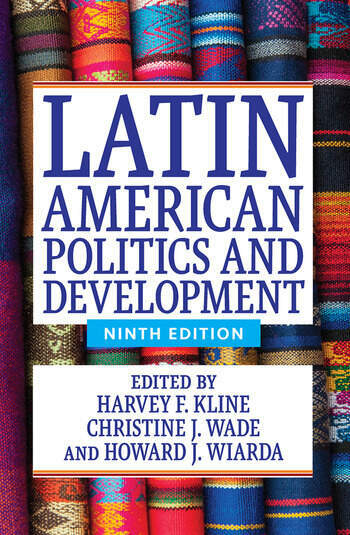 For over thirty years, Latin American Politics and Development has kept instructors and students abreast of current affairs and changes in Latin America. Now in its ninth edition, this definitive text has been updated throughout and features contributions from experts in the field, including twenty new and revised chapters on Mexico, Central America,the Caribbean, and South America. 11. Colombia: Is Guerrilla Violence Near Its End? 12. Peru: Overcoming the Authoritarian Legacy at Last? 19. Cuba: Revolution in the Balance? 23. Guatemala: Breaking Free from the Past? Harvey F. Kline is Professor Emeritus of Political Science at the University of Alabama. He is the author of numerous books including Colombia: Democracy Under Assault, A Concise Introduction to Latin American Politics and Development, Historical Dictionary of Colombia, Showing Teeth to the Dragons, and Chronicle of a Failure Foretold, among others. Christine J. Wade is Professor of Political Science and International Studies at Washington College. She is the author of Captured Peace: Elites and Peacebuilding in El Salvador and co-author of Understanding Central America and Nicaragua: Emerging from the Shadow of the Eagle. Howard J. Wiarda was Dean Rusk Professor of International Relations at the University of Georgia and senior associate in residence at the Center for Strategic and International Studies (CSIS) in Washington, DC. He was the author or editor of numerous books, including A Concise Introduction to Latin American Politics and Development.